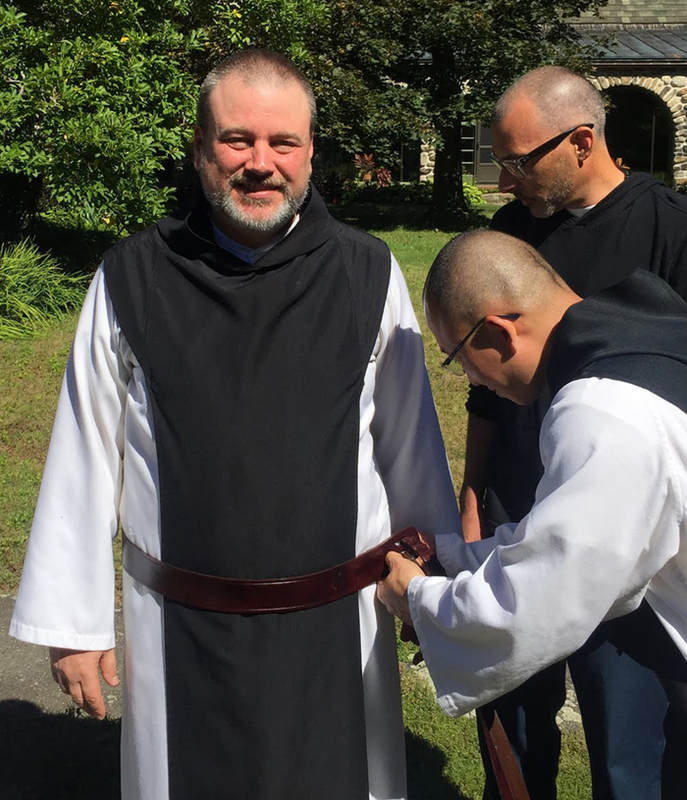 During Sunday Chapter on September 20, 2015, Brother Michael pronounced his simple vows and was clothed in the black scapular and leather belt of the professed. We rejoice with him. The ceremony began with Dom Damian asking Brother Michael, “What do you seek?” Michael responded, “The mercy of God and of the Order.” This brief dialogue reminded all of us that our life as monks is a life of total, loving dependence on Christ our Savior who constantly invites us to draw water in joy from the fountains of his mercy. In each one of us there is a desire, a single-minded longing for God, which is at the heart of the monastic vocation. 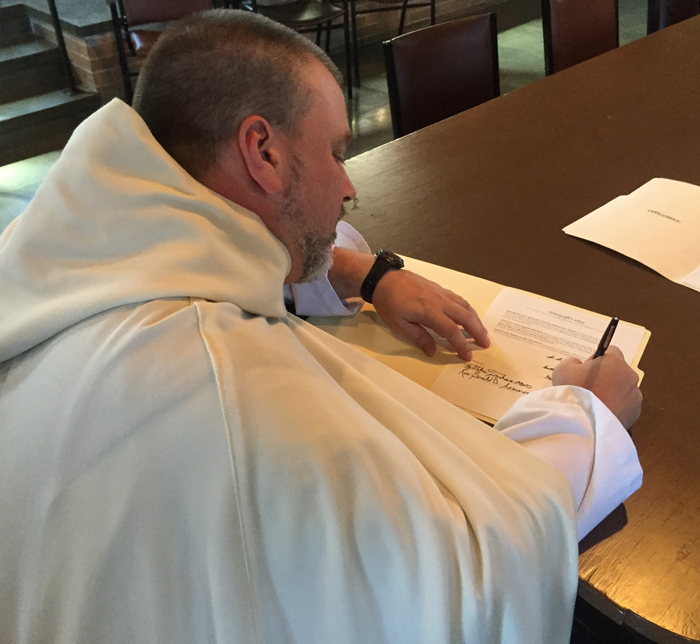 As Cistercian monks we seek to be oriented toward and responsive to God in every aspect of our lives, that we might become individually and communally channels of God’s love and mercy in the world. Following the Rule of our Father Saint Benedict keeps us connected with our deepest desire and the rhythm of God’s life in our own lives. And so we strive for singleness of heart in a life of self-supporting work and incessant prayer, gathering at regular intervals from before dawn until the end of day. Our communal prayer is powerful, because it reminds us of the true end and purpose of our lives. Well aware of our priorities, we need not ask whether we feel like doing certain things, whether we have time to pray, work, rest, exercise or eat. We simply do as we have promised. The emphasis, the ambience of the Rule of Saint Benedict, is always one of listening and obedience. We must never stop listening for what really matters, and then following through. This is really what obedience means. It is not some sort of mechanical subservience, but free self-gift. It is not doing what you are told, as much as becoming the Word you hear, in and through all the dimensions of your life in the monastery. Life according to the Rule of Saint Benedict is about seeking to align your life, in all its dimensions, with God’s life and God’s personal call to you. Whether we pray or not; whether we work or not; whether we relate to one another or not; whether we forgive or not- all of this matters. Leading a life according to the Rule is about encouraging one another and helping one another to deepen our listening and our loving. And may God who began this good work in you, Michael, bring it to perfection. –Excerpts from Abbot Damian’s address to Brother Michael.